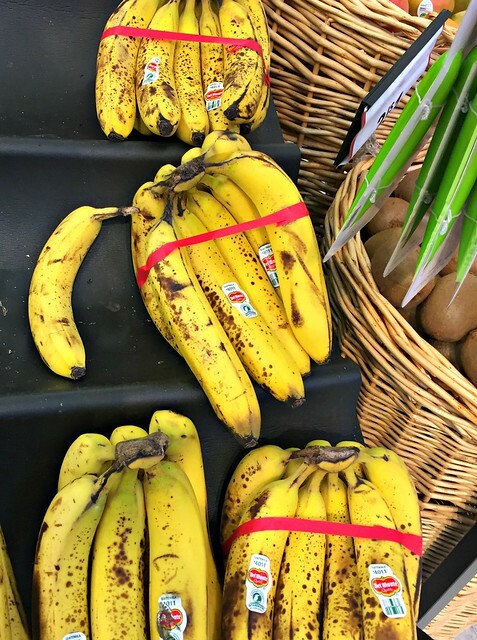 As I mentioned earlier this month, one of my favorite things is “red tape bananas” — which, if you have no idea what I’m talking about, are the very brown, overripe bananas sold for a deep discount at many grocery stores. I try to buy a bunch or 2 every time I hit the grocery stores, and I freeze them (in the peel) to use for baking throughout the next few weeks. 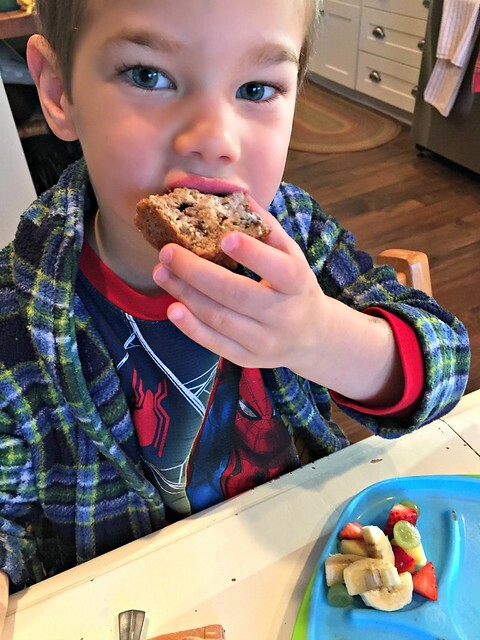 Banana bread is a HUGE favorite in our house, and my old stand-by recipe for Banana Chocolate Chip Bread (or muffins) is always a winner for breakfast, snacks, and even dessert. 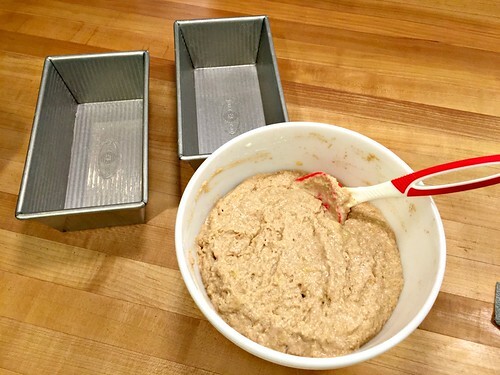 However, as I’ve been integrating more whole grains into our daily diet, I’ve started the process of “making over” MANY of my favorite recipes. My banana bread recipe was the very first quick bread / muffin recipe I made over — and after pulling several successful loaves of banana bread from my oven these past few months, I believe I’m FINALLY ready to share this recipe on the blog! My recipe is 100% whole grain; however, you could easily do a 50/50 mix, or even use 100% all-purpose flour if that’s what you have in the house. I’m sharing a few different variations of the recipe (mostly just different mix-ins like chocolate, granola, etc.) so you can tweak it to fit your taste buds. 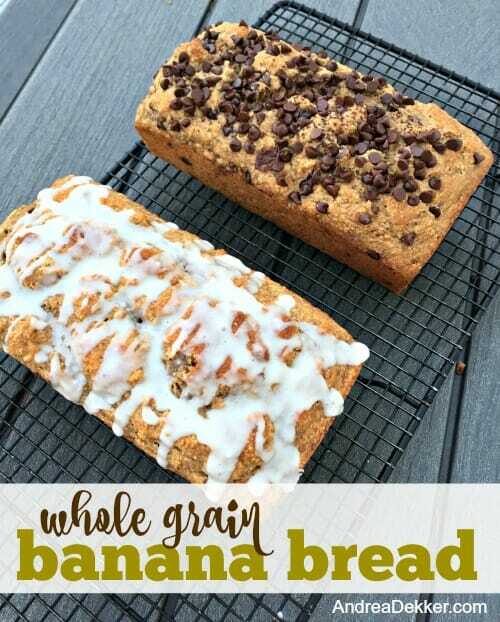 Either way, I’m confident this recipe will produce extremely moist, flavorful, sweet, delicious banana bread WITH the added benefits of whole grain, fruit, Greek yogurt, etc. * If you choose to add the chocolate chips you can decrease the honey to 1/4 c.
** If you choose to layer cinnamon-sugar in the middle and on top of the batter, you can eliminate the honey all together. 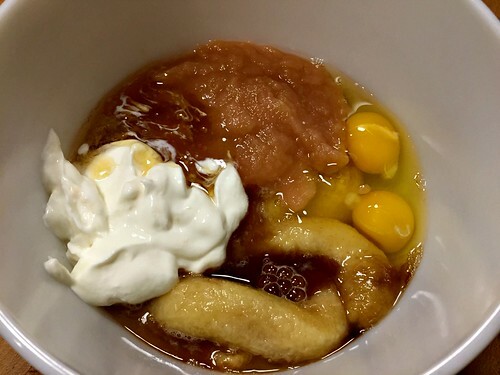 In a large mixing bowl, combine all wet ingredients (bananas, eggs, applesauce, yogurt, honey, and vanilla). Add in flour, powder, soda, salt, and cinnamon. Mix with a rubber spatula until just combined. Let batter rest for 10 minutes so the whole grain flour can absorb the liquid. Pour batter into prepared pans and sprinkle with optional toppings, or layer with cinnamon-sugar if desired. Bake in preheated oven for 40 minutes (less time for 9″ x 5″ pans). Remove loaves from pan and let cool on a wire rack. 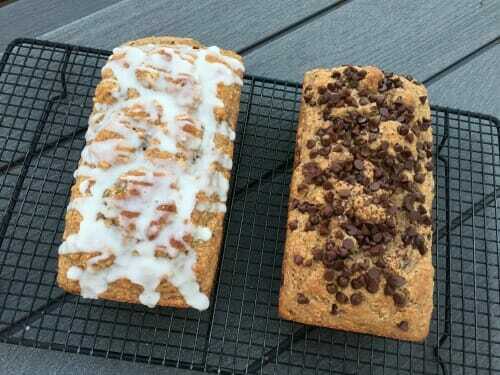 Drizzle still-warm loaves with glaze if desired. Eat and enjoy — or freeze for later. I usually make this bread first thing in the morning (hence the dark pictures above! ), so we can all enjoy still-warm-from-the-oven bread with our breakfast. We polish off the better part of one loaf for breakfast, and the kids usually finish the first loaf for dessert after lunch. I often slice the 2nd loaf and put the slices into individual bags and freeze for packing lunches or taking snacks on-the-go throughout the next week or 2. That said, this bread will keep well for 3-4 days if stored in the refrigerator. I leave it out on the counter the first day, but then refrigerate it after that as it’s very “wet” with all the bananas, yogurt, applesauce, etc. 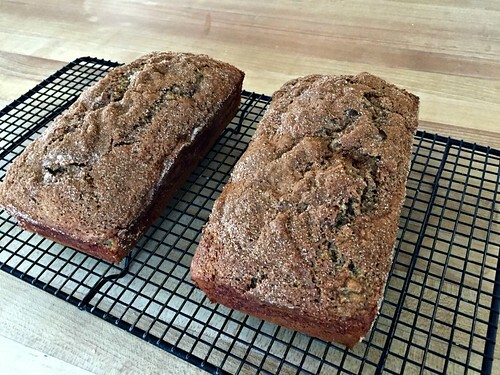 This has been my go-to quick bread recipe for the past 4 months… I’m certain I’ve made it at least 10 times since Christmas alone! The kids just gobble it up, and considering it is packed with fairly healthy ingredients, I almost always say “yes” when they ask for more! With chocolate chips and granola sprinkled on top. With cinnamon-sugar layered once in the middle of the batter, and then sprinkled on top. With a powdered sugar glaze poured over top. I’ve also made it into mini loaves (3 mini loaves = 1 regular loaf) which are PERFECT for gifts! What are you waiting for…. 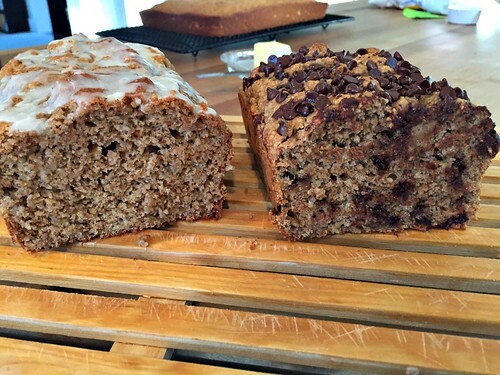 go stock up on overripe bananas and make some whole grain banana bread!!! 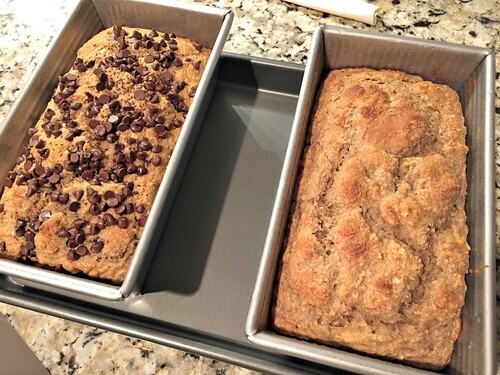 Do you have a favorite quick bread recipe? I know this is not a quick bread but have you made your English muffin bread with whole grains? I have successfully done it using 50/50 (using Bob’s red mill w/w pastry flour ) but have not tried 100% yet. I’ve made that recipe with 50/50 and with 75/25 (75 whole grain) and it has turned out fine. I haven’t tried 100% yet. 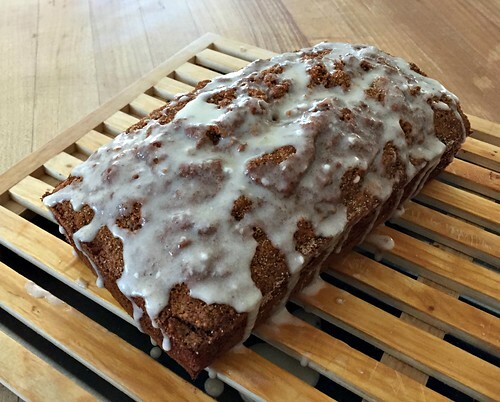 Banana Bread was on my plan for today and when I saw your post I knew I had to try this version! Thank you! 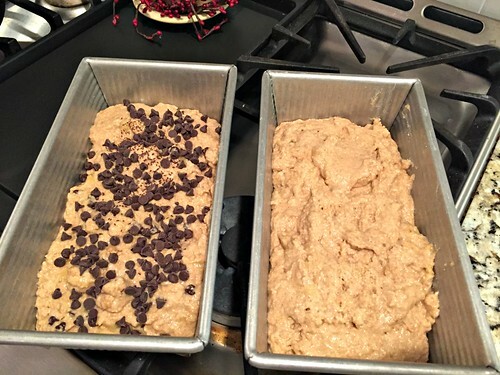 The kids are now in bed and the bread is in the oven, baking… I can hardly wait! Oh, my!!! Yummm!!! Have you made it without sour cream or yogurt? My crew has milk allergies, but if I could sub it for something else they would eat this up!!! We use vegan “butter” so I wonder if I could melt that? Thanks!!! yes, you can definitely do this without the sour cream/yogurt. Maybe us a bit more applesauce or oil (or the vegan butter) if the batter seems dry. That blob of yogurt in the photo looks like an alien–or a ghost. Complete with eyes. What ARE you baking with??? yes, I mentioned this in my post about the over ripe bananas… I DO peel some of our bananas and cut into chucks for smoothies. However, we like banana bread more than smoothies so I usually just leave them whole! Have you ever tried making these into muffins? 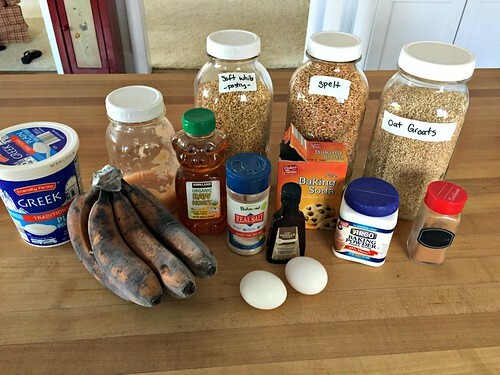 I love making your other banana muffin recipe into mini muffins. I keep them in the freezer and are easy for little hands and good for a quick snack. thanks! Looks yummy! I’m so excited about this recipe! 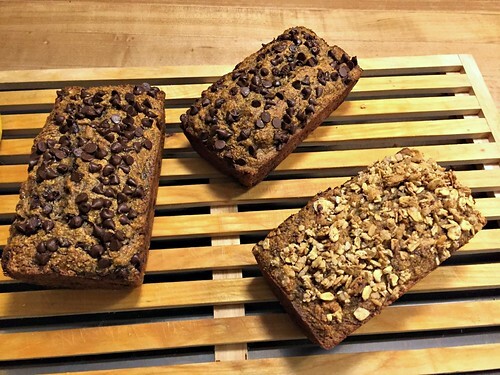 I’ve been trying to bake more healthfully and have struggled with keeping breads moist with whole grains. This recipe looks like it might be the answer! hopefully you love it too! Looks delicious!! I am making your loaded kale salad tonight. I will add this to my food prep for next week!! yum!! I’m having the kale salad for lunch today again! 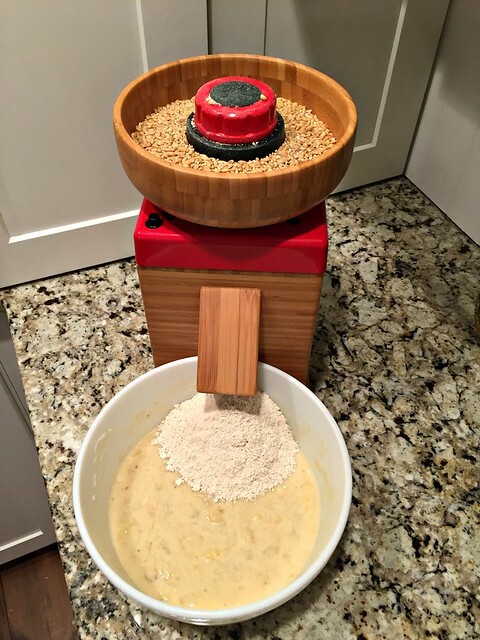 I have followed you for years and wondering how you got started on your whole grain journey. I am beginning to change our eating habits to a more natural environment and the grains intrigue me. I would love it if you did a post or maybe you have, and I have missed it. Where you buy your grains? How much do you buy? Do you store a certain way? Do you only grind up what you are going to use? How do you modify regular recipes to substitute whole grains? These are some of my questions. Look forward to hearing from you. Thank you. haha — there are LOTS of blogs and websites out there devoted to grains. I am not one of them as many (most) of my readers don’t read my blog to get information about grains. I did TONS of research before diving into grinding my own grain… which is what I’d suggest for you too. Figure out what YOU want for YOUR family and lifestyle and then go that route! 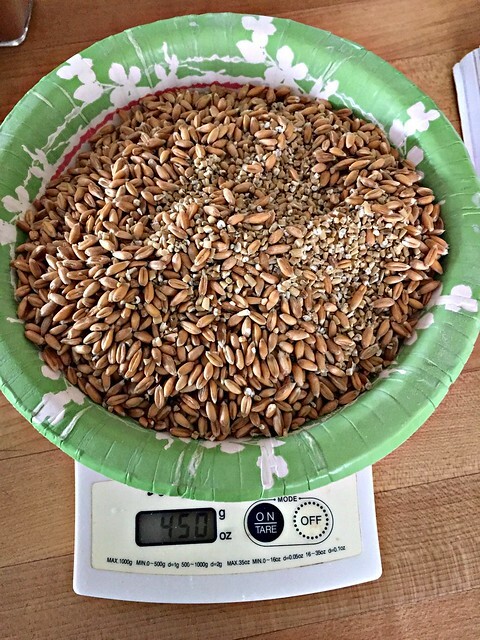 Oh, and I believe I linked to the post I wrote earlier this year about my whole grain journey. I’m not on my computer right now, but if you click on that link (in this post) or search my website for “whole grain” you should be able to find it!